There is drama to this dish. This is my third attempt and with all the lessons I’ve learned along the way trying so hard to make what probably was a ten-minute with their eyes closed at cooking school dessert, I needed a fourth time. But, here it is, redone and doctored, but not good as it could be, but still good enough to eat and leaving many cooking lessons in my head. One would never guess that I have no idea how to use my broiler (who broils?) and in ten stupid minutes pull a completely charred black dessert out of the oven. But, fear not, so determined not to waste what seemed like an hour of whisking by hand, I pulled back that black blanket and salvaged this dish. I have no attention span in the kitchen, and in case you didn’t know this, you need an attention span to broil sabayon which can burn very quickly. This dessert seems simple, yet there are rules you must follow. For example, Le Cordon Bleu at Home, from tells you to whisk the sabayon (which is wine, liqueur, egg yolks and powdered sugar) in a bowl that is placed in 2-3 inches of simmering water, and that water better not touch the pan, as it can curdle. And, there is a lot of whisking., but then I was so PROUD of what seemed like the perfect sabayon. The whisking builds the air in the yolks, resulting in an airy, creamy, silky texture. Perfect means silky, no curdling, and it falls easily away from the spoon without leaving a film. And, with a herculean tenacity to whisk the most beautiful sabayon, creamy and flavorful still tasting of wine and chartreuse, I whisked my dish into the oven under a very hot broiler. The book warns that sabayon burns easily, but they didn’t say “DON’T TAKE YOUR EYES OFF OF IT. It charred so black, and my face got that look on it as if I had just dropped an expensive vase. It’s done and it can’t be fixed. Or can it? With a surgeon’s precision, I took a knife and in one quick swoop, this black veil of crispy sabayon lifted off, and I took whatever I had left in the bowl and recovered the dish. I put it back in the broiler, never closing the door and never taking my eyes off of it, or my hand off the dish (pot-holder, of course). One second too long and it could burn. I think if I had the patience to try this a fourth time, I would get it perfect. Sabayon actually originated in Italy, where it is known as zabaglione, which I have had only in restaurants served with cold fruit. It has always been one of my very favorite desserts. Typically the Italian version is made with Marsala wine and doesn’t have as much sugar. The original recipe calls for some very expensive maraschinos liqueur, and I substituted with an even more expensive yellow chartreuse (but I had that on hand). Now you might just ask me “who has chartreuse on hand that isn’t at least 70 years old, living in America. I inherited the bottle. That’s the truth, and now was as good a time as any for it t make a debut in my kitchen. Chartreuse is named after La Grande Chartreuse, the Carthusian monastery near Grenoble, France, where the liqueur was first made and it was originally 142 proof. There are two kinds, green (110 prof) and yellow (80 proof). Chartreuse is made with 130 herbs and has long been considered medicinal. It has been referred to as the liquor of health and elixir of long life. The history of chartreuse is so dramatic, encapsulated in secrecy. Only two chartreuse monks know the right combination of herbs that naturally produces the yellow or green color and they personally supervise the slow aging in oak casks. The yellow is sweeter and can be enjoyed neat or in a mixed drink. I also found recipes for souffle made with chartreuse which I would like to try. The herbal properties complimented the mango and pear nicely. Never having made either sabayon or zabaglione before this, I feel a sense of accomplishment in mastering something I had previously only enjoyed in restaurants. I also like that this dessert does not use heavy cream. The lightness and flavor is delicious. It inspired me to do more research and make similar dishes. 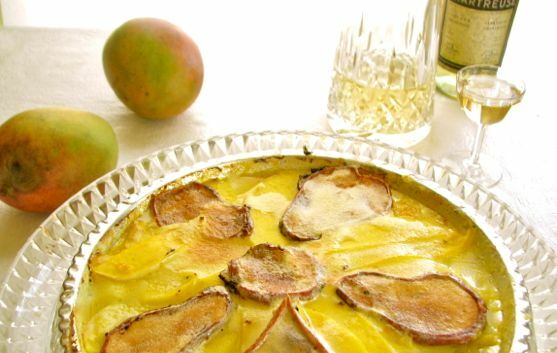 Tomorrow, I will feature a homemade mango Italian soft custard that is also cooked in a very similar manner, in a double boiler over simmering water.